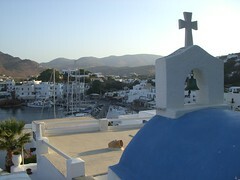 The Islands of the Cyclades are strewn with white churches, often with blue roofs and all with bell-towers. The bells would ring between 6pm and 7.20pm a single tone, often flat, with a basic tune conveyed by a regularly varied pace between the rings. Graveyards were normally accompanied by a small church, mainly churches stood alone on island high ground, often perched on Island mountain tops. This scribble was published on Wednesday, September 3rd, 2008. You can follow any banter on this scribble with the RSS 2.0 feed. You can share your inspired musings after typing the anti spam word near the bottom of the page. But no Pinging because its too naughty.